Ceramic water filter maintenance can be performed easily and directly affects filter performance and lifetime. Note: The content on this page has been adapted from publications of International Development Enterprises (IDE). By carefully following these water filter maintenance instructions, a ceramic pot filter will provide clear, safe, good-tasting drinking water. Using the filter will improve family health, reduce water expenses, and save time. If a ceramic pot filter full of water takes less than 3 hours to empty, the flow rate is too fast and the ceramic pot should be replaced. Soak the ceramic pot in clear water (may be rain or borehole well water) for 12 hours. Fill the ceramic pot three times, allowing water to seep through, and discard the filtered water. Doing one of the above steps will flush the clay smell and color from the ceramic pot. You only need to do one of the above steps. It is not necessary to do both. Lastly, clean the receptacle tank and the spigot with soapy water. Put the filter in a safe place where it will not get knocked over and secure it to a wall or a post. Clean the inside surface of the lid with soapy water and let it dry. Place the lid on a level surface with the clean side facing up. Carefully lift the ceramic pot out of the receptacle and set it on the lid. 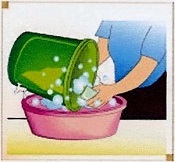 Touch only the rim when lifting the ceramic pot. Scrub the inside of the ceramic pot with a cloth or soft brush and rinse with clear water. Do not use soap to clean the ceramic pot. Clean the receptacle tank and spigot with soapy water. 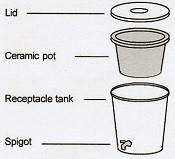 Put the ceramic pot into the receptacle tank immediately after cleaning to prevent recontamination. The pot does not have to be dried after cleaning. It is important to practice good hygiene along with good water filter maintenance to ensure that the water that leaves the filter clean stays clean. 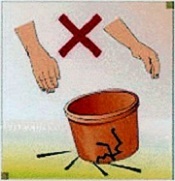 Do not touch the outside of the ceramic pot, the inside of the receptacle, or the spigot opening with dirty hands. Place the filter off the ground in a clean and tidy place. Wash hands and drinking glasses often with soap and water. •	The filter has been used for three years. Return to "Ceramic Water Filters" from "Water Filter Maintenance"